This construction video shows the detailed processes for developing perfect foundation for steel column footing. Foundation of a building must be very strong so that the building can sustain for a long time. The whole structure rests on the foundation. The loads of any building are transmitted securely to the ground through foundation. If the soil contains greater load bearing power, it can bear higher load securely. Footing stands for the lower end of a column, pillar or wall for transmitting load. Footings are designed to withstand the applied loads, moments and forces and the induced reactions and make sure that any probable settlement should be as constant as possible and the safe bearing power of soil is not surpassed. While going to estimate the steel quantities in a column footing, one should have clear ideas on the dimensions(Length, Breadth, Depth) of the structural member as well as shapes of bars to be applied. 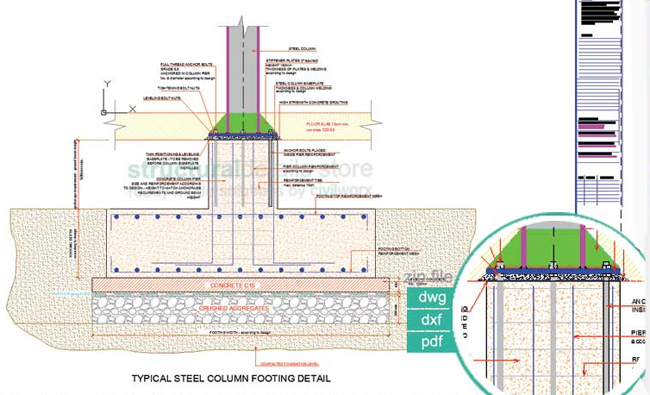 Now watch the video details of Steel Column Footing Foundation Design.